I recently saw a tweet by Calgary Roughnecks forward Scott Ranger in which he said something about being a diabetic. This struck a nerve with me, since both my wife and father-in-law are diabetic. Also, back in 2010 I spent two months in the hospital (and three more months at home) recovering from pancreatitis, a condition which could have left me diabetic myself. In fact, I was told by a nurse during my hospital stay that I was diabetic, since a blood glucose test came back with some astronomically high value. A subsequent test showed that the first test was messed up and I was fine. Anyway, I asked Scott if he would be interested in talking to me about his diabetes and how he deals with it as a pro athlete, and he eagerly agreed. We talked over email a few times and Scott was very forthcoming with his answers. He gave me lots of great information and I did a fair bit of research on my own as well. Because diabetes is a topic that is meaningful to me, I wanted to get the message out to as many people as possible and quite honestly, my lacrosse blog is not the way to do that. So I made use of (you could argue “exploited”) the fact that I write for IL Indoor during the NLL season and contacted my editor, Bob Chavez. He was happy to oblige and agreed to publish my article on IL Indoor, where it will likely reach far more people than on my little blog. In fact, Bob made it sound like I was doing him a favour by giving him something to publish during what is lacrosse-wise the quiet part of the year. Here is a link to the article, called Challenges of Type 1 diabetes can’t keep Calgary’s Scott Ranger from thriving. Many thanks to Bob for agreeing to publish it and of course to Scott for talking to me. 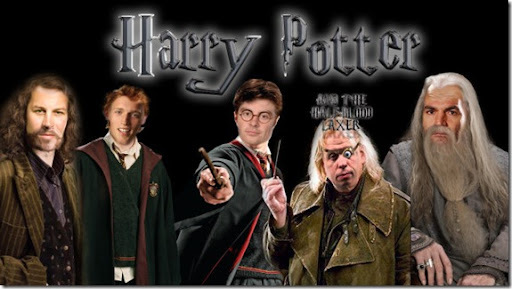 From the left we have Geoff Snider (Sirius Black), Connor Martin (Ron Weasley), Kevin Crowley (Harry Potter), Troy Cordingley (Mad-Eye Moody), and John Tavares (Professor Dumbledore). But how accurate is that “25 goals per game” number? On the surface, it seems about right – games like 14-10 or 13-12 are pretty typical, 18-15 is a little on the high side, and 11-7 is a little low. But if we actually crunch the numbers, what do we find? The first ten years or so were pretty unpredictable, ranging from 22.6 in 1990 to 29.1 only two years later. The extremes: the highest scoring season was 1992, when 29.1 goals were scored per game. 2011 was the lowest scoring season, with an average of only 21.7 goals per game. The first six seasons were interesting – two seasons in the mid 27’s, two low-scoring seasons of 24 and 22, then the two highest ever, 28.2 and 29.1. 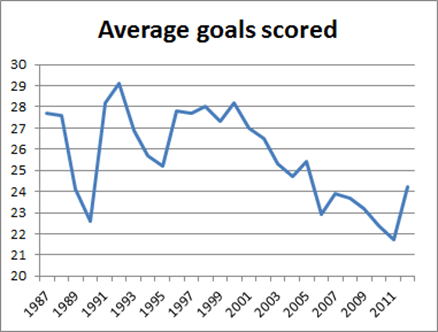 The obvious trend is that from 2000 until 2011, the number of goals scored dropped pretty steadily, from 28.2 in 2000 to a low of 21.7 in 2011. The NLL increased the width of the nets from 4’6″ to 4’9″ in 2002, and one of the first games of the 2002 season featured the Montreal Express defeating the Calgary Roughnecks 32-17. Fans wondered if that would be the norm with the new nets, but in the end it made little difference; the average actually dropped about half a goal from 2001 to 2002, and then down over a full goal the next year as goalies adapted. However in 2012, a number of rule changes were made in an attempt to speed up the game, and seemed to have the (possibly unintentional) effect of increasing scoring as well. After the lowest-scoring season ever in 2011, scoring rebounded in 2012, jumping 2½ goals per game to 24.2. The 8 second rule (instead of 10), the “immediately drop the ball on possession changes” rule, and the fast starts all meant that there were more transition chances, and many of those were converted. In addition, the faster the transition, the more likely that an offensive player will get stuck on the floor playing D, and some offensive players are just not the two-way players of old. They’re not all as skilled at their own end of the floor as at they are the other end, and so playing five top offensive players against four defenders and one O guy playing D gives the offense a bit of an advantage. Defenders were also forced to give up their longer 46″ sticks for 42″ sticks, obviously making it harder for them to stop the John Grants and Dan Dawsons of the league. Finally, on a five-minute power play, three goals are now required to allow the penalized player out of the box instead of two. I don’t think this rule came into effect all that often, but it did mean that some 5-on-4’s lasted longer in 2012 than they would have in 2011. Other than the eligible players and their families, it’s probably safe to say that the majority of people who attended this week’s NLL Entry Draft had been to previous drafts. Most of the GMs, coaches, scouts, and executives have likely been to many of them. Some are former players and were drafted themselves. But as a lacrosse outsider, this was my first time. Some of the event went as I expected, and there were a few surprises as well. For others out there who have never been to a draft, here are some of my observations. These are all serious, unlike the goofy thing I posted yesterday. 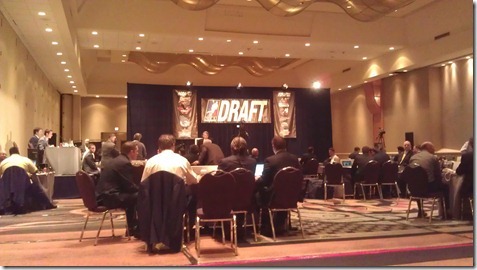 The draft took place at the Westin Harbour Castle in downtown Toronto, one of the most well-known and swankiest hotels in the city. Coincidentally, this was where my high school prom was held, back in (OMG) 1987 when it was the Harbour Castle Hilton. I arrived around 6:40pm, and the draft was scheduled to begin at 7:00. There was a stage at the front with a big “NLL DRAFT” banner behind it, as well as banners on each side with all of the team logos. To the left of that was a table where the commentators Andy McNamara, Stephen Stamp, and Randy Mearns sat, and directly in front of the stage were a number of long tables, one per team. I couldn’t see all of them, but the Rochester and Calgary tables were at the back. Edmonton was in front of Rochester, and Buffalo in front of them. Minnesota was in front of Calgary. I sat in the front row, off to the left behind the Rochester table. Looking around the front of the room, I saw a who’s who of NLL people – at one point without even moving my head I could see Curt Malawsky, Bob McMahon, Jamie Dawick, Terry Sanderson, Darris Kilgour, Steve Dietrich, Curt Styres, Bob Hamley, and George Daniel. A number of people from the Rochester scouting staff, including NLL legends Chris Driscoll and Paul Gait, were sitting in the row just down from me. In this picture (click to enlarge), you see the Rochester table right in front of me. Owner Curt Styres is the guy with the braid. Andy McNamara and Stephen Stamp are sitting at the table on the far left. At the right edge is the left half of Calgary assistant coach Bob McMahon, and Curt Malawsky was sitting next to him (just out of the picture). You can also see Minnesota play-by-play man and scout (and last year’s Tom Borrelli award winner) Jake Elliott on the right – the big bald dude who’s seemingly looking right at me. Hi Jake! The public seating was mostly empty when I got there, but there were a number of people milling about outside the room. Just before the proceedings began, I looked around again, and it had mostly filled up. There were a lot of young nervous-looking faces out there with girlfriends and parents. By the end of the night, many of those faces were smiling above brand new NLL jerseys. Around 7:00, the event got underway. Andy McNamara, play-by-play voice of the Toronto Rock, was the MC for the evening, and introduced Stamp and Mearns as well. After a few words about what we can expect (including the exciting reveal of who the first player was going to be… not that we hadn’t known for weeks already), Andy turned things over to commissioner George Daniel and VP of Lacrosse Operations Brian Lemon, who explained a few of the rules. Basically, the teams were free to choose whoever they wanted, but if a player turned out to be ineligible or a pick was otherwise illegal, the pick would simply be retroactively cancelled. Each team had five minutes to make their selection in the first round, and two minutes in subsequent rounds, and each team had two five-minute extensions that can be used anytime. I believe the Bandits were the only team to use an extension. Before long, Daniel announced that the Edmonton Rush were now “on the clock”, and the Rush brass panicked, since they only had five minutes to come up with… well, no, of course they didn’t. The Rush announced a while ago that Mark Matthews was going to be their pick, so less than a minute later, Daniel was up on the stage again making the least surprising announcement of the night. Matthews came down to the front, was given his new jersey (complete with his name on the back), and had the obligatory picture taken. He then went back to the table with the the Rush people and sat there the rest of the night, presumably providing input about players he knew for future rounds. Minnesota had the next three picks, and I expected them to make all three at the same time, but they treated them as three separate picks. Brock Sorensen, here’s your jersey, take a picture. A couple of minutes later, Kiel Matisz, here’s your jersey, take a picture. A couple more minutes, Shayne Jackson, here’s your jersey, take a picture. This made total sense though; getting drafted is a big deal for these players, especially so high in the first round, so I’m glad that they didn’t water it down for these players by combining the picks and jersey presentations. After the jersey presentation and pictures, each player was interviewed briefly by TSN’s Claude Feig, and most players ended up giving the same stock answers. It’s a dream come true, I’m excited to join the team, I’ve heard great things about them, looking forward to training camp, that kind of stuff. Not that any of them weren’t being genuine, and I imagine most of them are pretty new to giving interviews, but you did tend to hear the same responses over and over. It was amusing at the beginning when Feig talked to the first three picks and mentioned their height. They were all 6’4″ or 6’5″ – as tall as Feig himself who said later that it was “nice to have someone eye level to talk to.” Earlier in the evening, I saw Stephen Stamp walking up to the front, and he looked even taller than Feig. In between picks, Stamp, McNamara, and Mearns offered analysis of the picks and players, and what each player could bring to their new team. Offensive star, defensive specialist, big and strong, small and wiry, hard shot, great passer, even one guy they described as something like “a really annoying guy to play against”, they knew something about everyone. Despite the lower time limits, I didn’t notice the second and subsequent rounds going any faster than the first. Actually, the whole thing moved along pretty quickly. Once we got into the third and fourth rounds, some of the people chosen were not present as we got into the “what the hell, let’s take a chance on this guy” picks. At one point, I’m sure Chris Driscoll said “who?” as a name was read. There were only two trades on the night, both involving Minnesota and both picks for picks, no actual players involved. I was hoping for some obvious signs of talks going on, like seeing Terry Sanderson leaning over the Minnesota Swarm table saying things like “Sure, we can take Jordan MacIntosh off your hands”, but first off there were too many people wandering around, and secondly I didn’t recognize everyone up there, since there were GMs and assistant GMs and coaches and assistant coaches and scouts and owners and players (John Tavares was at the Bandits table) and possibly other people as well. The only thing that was really different from what I expected was that George Daniel read out all the names of the players. For whatever reason, I expected each GM to come up and announce their pick, which is the reason I wrote the “behind the scenes” article as I did. I enjoyed the draft and I’m glad I went, though I kind of wish I’d stuck around a little longer afterwards and introduced myself to some of the people I’ve talked to on Twitter a bunch of times but have never met in person. I know that some people had issues with the internet feed at the beginning, but as far as I could tell, the night went without a hitch. For a league that doesn’t have anywhere near the resources of the NHL or NBA, I thought they did an excellent job – it certainly didn’t look like a shoestring-budget kind of event. For those of us that are not lacrosse insiders, it was fascinating to see the inner workings of the league in action. The NLL entry draft took place this past Monday in Toronto, and was broadcast live on NLL.com. But the broadcast was just NLL commissioner George Daniel repeating the picks that the GMs gave him. The actual drafting process was a little different. I managed to record it, and I’m posting a transcription of the first round here so that other fans can see the real behind-the-scenes action that wasn’t shown on the broadcast. George Daniel: Welcome everyone to the 2012 NLL Entry Draft. Many thanks to the Toronto Rock for hosting this year’s draft and yesterday’s combine, and good luck to the eligible players. Without further ado, let’s get right to it! The first pick goes to the Edmonton Rush. Derek? Daniel: Yeah, yeah, the Rush pick Mark Matthews. We’ve all known for months. 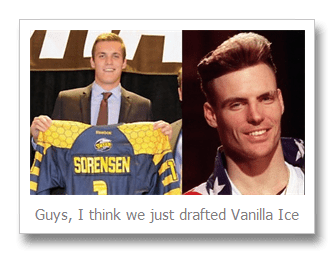 Moving on – the Minnesota Swarm have the number 2, 3, and 4 picks. John? Daniel: John, you only get three choices right now. Arlotta: Oh right, sorry. Got carried away there. Daniel: Thanks John. Next we have the Buffalo Bandits. Steve? Steve Dietrich: (talking quietly) Um, hi everyone. It’s me, Steve. (whispering) Wow, that was a dumb thing to say. C’mon Steve, pull it together. Daniel: Don’t worry Steve, we know it’s your first draft as a GM. No need to be nervous. Dietrich: OK, thank you Mr. Daniel sir. Um, has Mark Matthews been taken yet? Daniel: Yes, Mr. Matthews has been taken. Dietrich: Well, then, I guess our pick here is, um, Dhane Smith? That’s OK, right Darris? Daniel: Thanks Steve. Next we have Calgary. Mike, you have two picks. Mike Board: How about Mark Matthews? Daniel: Um, Matthews is gone. Board: Yeah, figured as much. Thought I’d give it a shot just in case Derek forgot or something. Anyway, Calgary takes Joe Resetarits and Matthew Dinsdale. Daniel: Thank Mike. Derek, we’re back to the Rush for number eight. Keenan: …and so with the first pick in this year’s National Lacrosse League entry draft, the Edmonton Rush choose, from the University of Denver and the Denver Outlaws, Mark Matthews. Daniel: We got that one already, like twenty minutes ago. Who’s your pick at number 8? Daniel: Thanks. Oh by the way, the University of Denver teams are called the Pioneers, not the Outlaws. Keenan: Yeah I know, I meant the MLL team. Keenan: The MLL? You know, Major League Lacrosse? The field lacrosse league? Daniel: Moving on, Steve, I believe it’s your turn. Steve Govett: Mark Matthews is gone, right? Daniel: (rubs forehead) Yes. Matthews is gone. Govett: OK then. I like this Colton Clark guy. Colton. That’s a strong name. Sounds like a cowboy or something. Good Colorado name. Hope he’s a decent player. Daniel: All right, for the last pick of the first round, we go back to the Minnesota Swarm. Daniel: Yeah, I was hoping he and that Matisz guy wouldn’t get picked so I wouldn’t have to say their names. I already spent half an hour getting Resetarits right. Anyway, that ends the first round. If someone can go wake up Doug Locker and Terry Sanderson, they are picking soon. And just let Styres and Mouradian sleep, they’ve got another round or two to wait. Curt Styres: Hey, we’re with ya, we’re paying attention, aren’t we Johnny? Johnny Mouradian: (asleep, mumbling) Sure Kevin, you can have a sweater just like Brodie and Dan. Daniel: Don’t even go there.